Swimmers from all over the North Island congregated at the Rotorua Aquatic Centre recently for Swim Rotorua's Summer Sizzler. The annual event, held earlier this month, attracted 132 swimmers. The event was also supported by Swimming Bay of Plenty who used it as part of their junior camp for swimmers aged 12 and younger. Jasmine Hagan, 14, was in formidable form as she claimed five first places and finished as top scorer in the Fina point competition. In the 400m freestyle she achieved a new best time of 4m 44.06s. The boys' winner of the Fina points competition was Jack Weston who produced a swift 50m breaststroke with a time of 30.69s. Jack also picked up a win in the 100m breaststroke. Swim Rotorua's strength in depth saw them win most of the events on offer. Winning three events or more included international Josh Balmer, 15, who won the 50m backstroke and the 50m and 200m freestyle. Alex Cameron, 14, was another who bagged three first places with a new best time of 9m 57.17s in the 800m freestyle. Annelyse Cowie, 14, went two better to claim five wins including two in her signature breaststroke events. Her older brother Damon, 17, snapped up three wins which came in the 1500m freestyle, 100m butterfly and 200m breaststroke, plus overall winner in his age group. Skye Cox remains unbeaten in the girls' 16 years and older division with a five star showing. Her exploits ensured that she won her age group category. Luke Crombie, 15, showed his potential with a trifecta of wins in the 100m freestyle, 50m and 100m breaststroke. This earned him top overall place in his age group. Rocco Marsh took home the spoils in the boys' 16 years and older division with classy wins in the 200m medley and 100m and 200m freestyle. Ariel Muchirahondo, 9, dominated his events and came out with eight first places, including three new Bay of Plenty records. These came in the 200m breaststroke and the 100m and 200m backstroke, which also earned him top scorer in his age group. Joe Nagera blitzed the field in the sprint events with victories in the boys' 16 years and older 50m butterfly, 100m medley, 50m and 100m backstroke. Nikita Pola produced a superb series of wins in her 13 years age group. The pick of the bunch came in the 800m freestyle where her time of 9m 58.14s qualified her for the National Age Group Championships. Molly Sinclair, 15, picked up five wins and overall age group winner with her best effort coming in the 200m freestyle. Competing in the same age group and making a welcome return to racing was Milla Theobald. Milla took her opportunity well and came first in the 50m freestyle, breaststroke, backstroke and butterfly sprints. Dion Wright, 13, produced six best times and six wins across a variety of strokes and distances which earned him top spot in his age group. Catching the eye was his steely determination in the 1500m freestyle where he posted a great time of 19m 38.43s. Swim Rotorua juniors who competed in Bay of Plenty colours included Kaia Joyce, 11, who took six victories and overall age group winner. Older brother Miki, 12, enjoyed success in the breaststroke events with three strong wins. 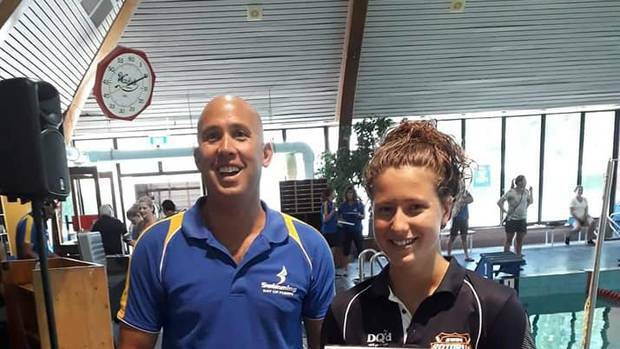 Ngamihi Simpson celebrated her recent 12th birthday with a haul of five wins, including a cracking 200m freestyle with a time of 2m 23.64s. Ava Tremain was in sparkling form too with four wins to her name. These came in the girls' 10 years 50m breaststroke, 200m medley, 200m and 400m freestyle. Head coach Alastair Johnson was pleased with the day's work. "Everyone has yet again raced their hearts out and have really pushed themselves. It has been great to see the younger athletes step up with their race skills and intensity. This has been a very positive start to our 2019 campaign. In the meantime, we will keep up the momentum as we start the countdown to the various national meets."